This is the only place in its price range that requires that you order at the bar, and pay in advance. It's not too noisy here, but noise from pub patrons, and the music, don't make this an ideal place for conversation. Lighting in here is dark and yellow. Will see how photography goes. Cauliflower, king brown mushrooms, snow peas & jalapeño ponzu. The taste of duck here is replaced by a sort of vegetable and orange taste. 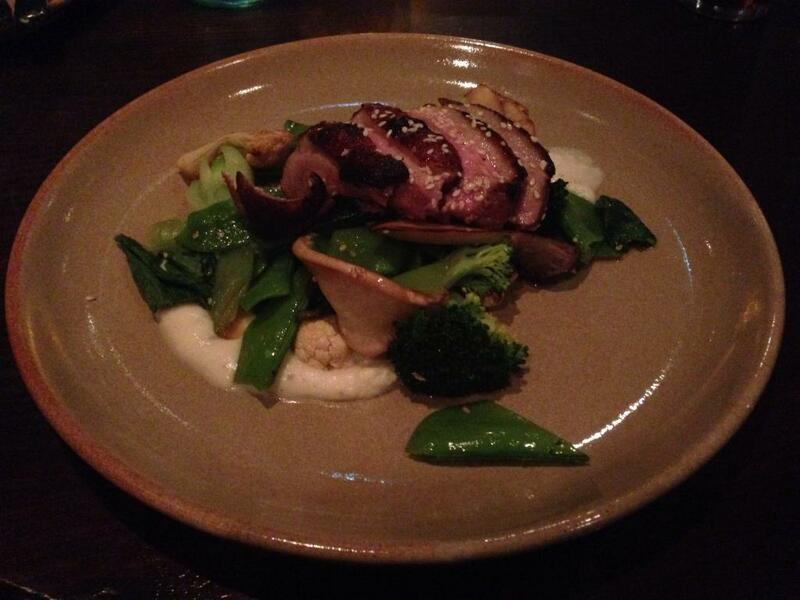 It's slightly unusual to eat duck infused with other tastes, but it does taste fairly good. I try to combine the duck with other elements on the plate, but there's no strong flavour to be found in cauliflower purée or slices of gigantic mushroom, so I just eat the duck by itself. The plate is littered with a variety of similar vegetables, including bok choy, snow peas, broccoli, and cauliflower. The miso duck sauce and cauliflower purée are good enough sauces for the vegetables, but it's just a big, indistinguishable pike of sauces and vegetables. Passionfruit ice cream, coconut jelly & cream. The crumble isn't a normal crumble. It doesn't have a crust — more a layer of crumbly sand. It does have a nice macaroon taste, even if it doesn't hold together at all. The fruit under the drummer, which I think is apple, is sweetened by some pineapple juice. 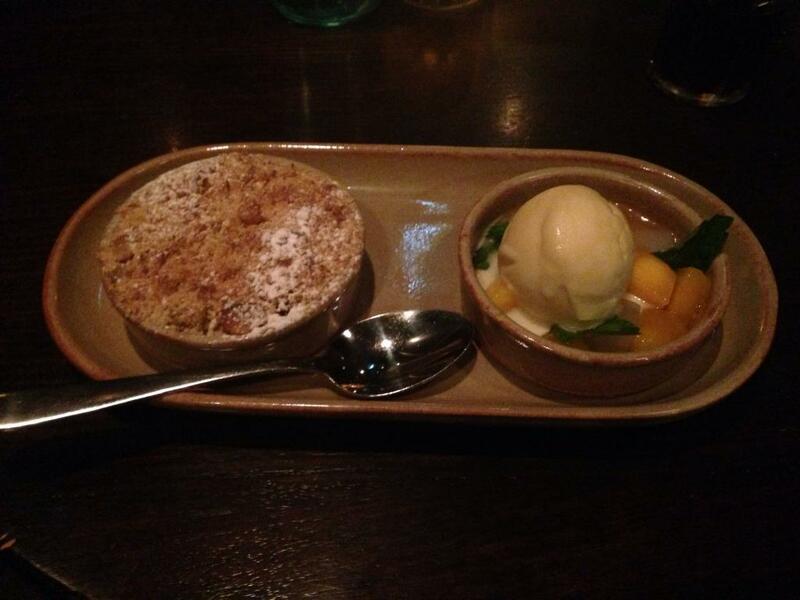 I want to add the ice cream from the other bowl to this crumble, but I think it's friends with the fruit salad. I do it anyway. Oops. Thought it was vanilla. It's some kind of tropical fruit. Back we go! The fruit salad contains giant mint leaves. I've expressed my feelings about whole mint leaves previously. Mint is so strong that it needs to be spread throughout a dish. If I've mouthful has a mint leaf, but another doesn't, the tastes are way too different. Here, I just hammer the mint leaves withy spoon, to extract some mintiness, rather than trying to eat them. This fruit shad contained lychee bits, peach, and the tropical sorbet I had previously thought was vanilla ice cream. I don't want to eat this many fruit favours together. Vanilla ice cream would've been better here. Parking. Had to go a fair way west this time.